In all reality, the drought of 2011 in Southeast Texas has not ended, especially here in The Woodlands and westward. With temperatures in the 100s in much of the state, the threat of dangerous wildfire remains with us. 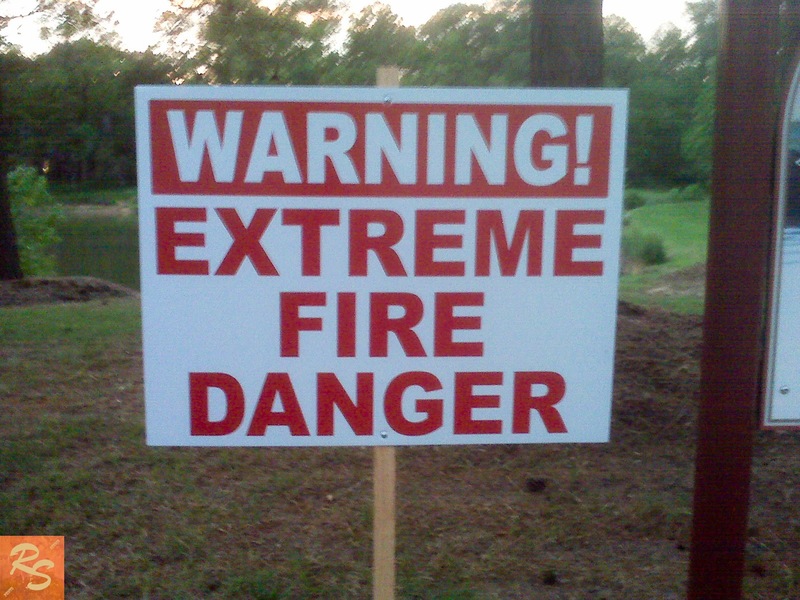 "Extreme danger" is the highest threat issued in Texas. That level of threat means it is dangerous to light a fire of any sort outside. Just prior to July 4th, there were several huge wildfires raging in Texas. The reason that one of these is so hard to control is the state of the timber, the grass, the wind and temperature. I walked through the forest several times during the worst of the dryness in July. There were few to no butterflies in places where butterfly enthusiasts normally count the bugs for relative annual comparison studies. 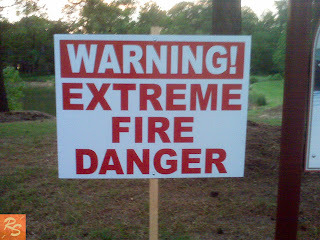 My friends and I all readily noticed what the forest was saying, long before an extreme danger alert had been posted. Butterflies are a very good measure of the health of the ecosystems and environment. The variety and number of butterflies are measured each year as benchmarks of ecosystem health. These "counts" are conducted at the same times and in the same ecosystems each year. This early summer, we had zero sightings in places we normally see many, and we had less diversity, although it has been amazing me that we generally see a fair diversity in some places, even in these tough times of drought. We had a reminder just yesterday that the danger is far from being over, with a new wildfire nearby. Very little rain has fallen this year, and the lack thereof is in addition to last year's drought. Due to the lower volume of rain, the water table is diminishing in a similar way as the shorelines of our ponds are retreating. For the first year ever, turtles have been seeking places to lay eggs in our yard. They do not have their normal ecosystem in the park to support their eggs. Even if they did have a protected mud area, their young would not likely survive due to the lack of water vegetation along the shoreline. The fish population will also suffer severely, because fish fry do not have any place to hide from predators. Inside the forest, where water has always been plentiful in creek beds and marshes, there is no water. Several creeks in the national forest were totally dried up in July. Therefore, many deer and other creatures are struggling to survive. Lack of food and water have surely diminished their numbers. We found a few pools of water and mud in just a few locations, giving us hope that we would have at least a fair survival rate in some areas. There were not many tracks at those locations though. Near Lake Conroe, there will be better survival stats, I am relatively sure. That lake has not suffered as bad as one might think, compared to the lakes of central Texas. We are sure to remember this year as one of the driest ever, the worse drought in a century. We all have our fire departments to thank for reducing the risk of fire in our neighborhoods, by outlawing outdoor fires and July 4th fireworks this year. As Fire Chief Benson said, "we always have fires generated from our fireworks shows. There is no need (this year) to have buildings catch fire and costly damage because of our fireworks display." I hope my neighbors in The Woodlands are taking measures to trim back vegetation from their home and making sure the dried combustibles are removed. That is the responsibility of every resident in the community. Here in the heart of The Woodlands, our drought is quite apparent. I along with several other amateur volunteers have rigorously been measuring the rainfall accumulation for years now. We have recorded rainfall to the nearest one-hundredth of an inch every day. Certain areas are naturally drier than others, but theoretically it all averages out over time, like the stock market. However, like the stock market in practice, it just doesn't work out exactly that way. The more measuring stations, the clearer the variations are. If we had a three or four inch rainfall over the entire area, then the severity of this drought would be called into question. Right now, I don't see how we can lower the signs.We are in a very severe drought. For the first six months of 2011, we received a total of 8.45 inches in our Indian Springs neighborhood. The norm for our area for the first half of the year is about 24.5 inches. We had 16.5 inches last year in the same period during the 2010 drought. The Woodlands is very thirsty this year! Make sure you water your trees and foundation this year, especially if your home is situated on clays which shift and expand. Individual large trees can be watered with a helical soaking drip hose. In porous mulch or sandy dirt, water is not retained very well, so frequent hand watering or drip watering is the most effective means of maintaining sufficient water in the shallow soils of your annuals. Even native plants often require frequent watering in 100 degree heat. Some will wilt and that is OK, but if that condition is allowed to continue for long, native plants will dry out also and die. The term "withering away" is really applicable this summer. Remember that it is necessary to train plants to seek water with deep roots. Try to encourage plants to do so by watering deeply to reduce watering frequency where you are able to do so. Some trees have a defensive mechanism to protect itself from drought. The trees just withdraw their sap as if it is fall and can come back next year or even this year if we receive sufficient rain in the growing months of summer. When searching for butterfly eggs on native plants, some butterfly enthusiasts have noted the lack of thereof on plants that normally are stripped of their leaves by caterpillars at this time of the year. This has been caused by two weather events - the drought and the extreme cold that reached deep into Mexico this past winter, killing many of the Monarchs and other migratory species. Maybe we will receive a tropical system to turn this all around. I expect us to go to mandatory outdoor watering schedules very soon, despite the recent rains and the fact that we are operating a full well configuration this summer, pumping at near capacity. Maybe we will get a tropical system to dump a large volume of water to help us out.